The Quick were a great unsung power pop band who sprang, as did I, from the smoggy, sprawling, sun-drenched San Fernando Valley. Formed by guitarist Steven Hufsteter and drummer Danny Benair (who'd go on to The Cruzados and The Weirdos/The Three O'Clock, respectively), the group added singer Danny Wilde (later of The Rembrandts), bassist Ian Ainsworth and keyboardist Billy Bizeau and inked a deal with Mercury. 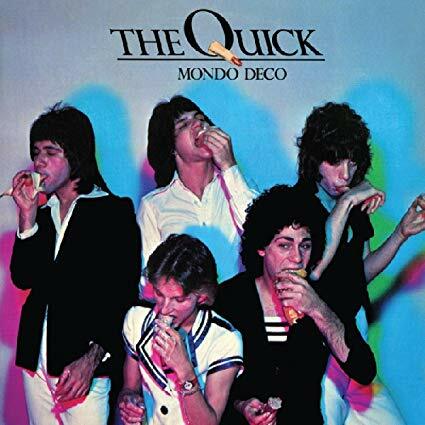 Their 1976 debut album, Mondo Deco (now reissued via Mercury/UMe/Real Gone Music), is a monument to tight hooks, tasty riffs, cool harmonies and that lovely musical space where power pop, new wave and glam meet. The set, produced by Kim Fowley and Earle Mankey, kicks off with a frenetic cover of The Beatles' "It Won't Be Long," and is followed by a suite of groovy originals ("No No Girl," "Hillary" and "Anybody" among the highlights) as well as a handful of demo versions. While the band didn't last, it's great news that this reissue can continue inspiring pop-leaning guitar bands, many of which have convened or will be convening soon at the International Pop Overthrow festival (go here for L.A. schedule). Expect more than a few nods to The Quick during that confab.